Wolfgang Wahlster is the Director and CEO of the German Research Center for Artificial Intelligence (DFKI) and a Professor of Computer Science at Saarland University. He has published more than 200 technical papers and 12 books on user modeling, spoken dialog systems, mobile and multimodal user interfaces, the semantic web, as well as the internet of things and services. He is a Fellow of AAAI, ECCAI, and GI. 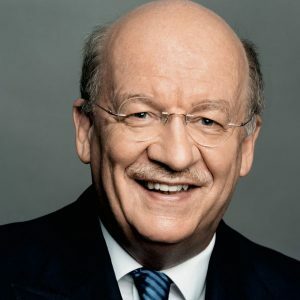 In 2001, the President of Germany presented the German Future Prize to Professor Wahlster for his work on intelligent user interfaces, the highest personal scientific award in Germany. He was elected Foreign Member of the Royal Swedish Nobel Prize Academy of Sciences in Stockholm and Full Member of the German National Academy of Sciences Leopoldina that was founded in 1652. He has been awarded the Federal Cross of Merit, First Class of Germany. He holds honorary doctorates from the universities of Darmstadt, Linkoeping and Maastricht. He serves on the Executive Boards of the International Computer Science Institute at UC Berkeley and EIT Digital. He is the editor of Springer’s LNAI series and on the editorial board of various top international CS journals. In 2013, Wolfgang Wahlster received the IJCAI Donald E. Walker award for his substantial contributions, as well as his extensive service to the field of Artificial Intelligence throughout his career.